Note how many emphasised the derriere. Many have room for a crinoline, but there were also wiggle dresses at this time- very tight around the hips. They're not as tiny as the Edwardian dresses, but most are still fairly small for these days. 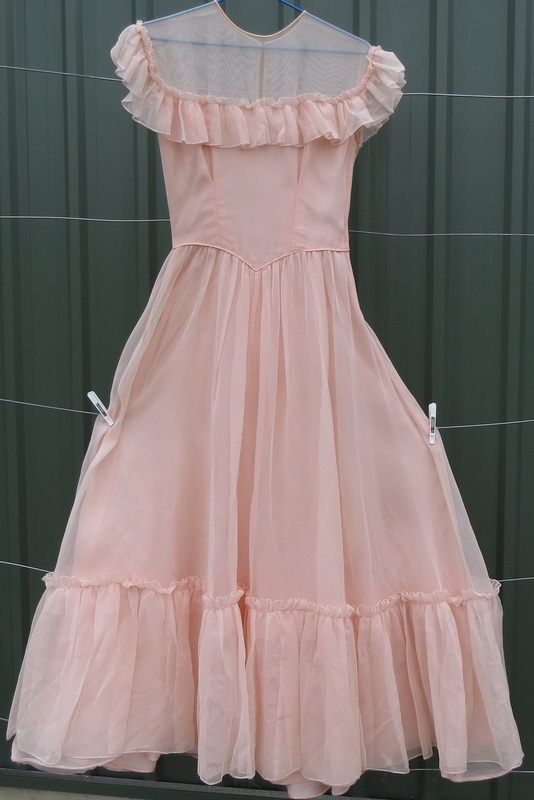 1950s full-skirted (rockabilly) 2 XS and S Many have a built-in lining or petticoat, but most would be more striking worn over a crinoline for added fullness. Original 1950s. 50F17. B 85, W 63cm. Underarm to waist 19.5cm, waist to hem 93cm. 1940s or 50s. Designer Fred Perlberg. Peach-coloured taffeta over marquisette. Bustle flounce at back. Double ruffle at hem. $70.